Since 2013, we have followed a crescendo of rising home prices stemming from fabulously low interest rates and scarce inventory. In late spring 2018, buyer resistance to sellers’ ever higher price expectations kicked in and bidding wars slowed. Additionally, an exceptional number of local homeowners decided to sell in the same year, and rising interest rates impacted affordability. 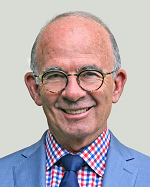 SALT tax changes and the Westfield revaluation, in this author’s belief, drove sellers to sell more than inhibiting buyers from buying. If you are a buyer, here are two great reasons to choose your next home sooner than later. In the towns we study, especially over the median list price, the supply is abundant, and sellers are negotiating/reducing. Our great towns are on sale! And as rates keep rising, they will impact buying power more and faster than prices may abate. To illustrate, for a buyer with $200,000 Income and a 25% Down payment, at current rates of about 4.72%, you qualify to shop for a home up to $1,100,765. If in the coming year rates reach predicted 5.61%, your buying power will top out at $995,672. * Same income, same payment, less lifestyle. So unless you want an older, smaller house on a busier street next year, why not get off the fence this year? For sellers, the persistence of the inventory and the interest rates’ effect on affordability suggest that holding out for next year equals holding out for less money for your home. Whatever your price range, the pool of qualified buyers will be smaller and the competing inventory is likely to be greater. If you are ready to go, and don’t want to wait 5-7 years for the market to favor you, go while the time is propitious. Please Email me if you would like to see highlight slides from the Workshop. As prices peak, demand slows. Sellers have controlled the residential market since 2013, and notched price gains every year. So good news: in almost every town we study, average sale prices are up again since 2017. Now, in 2018 the market has bumped into a ceiling. 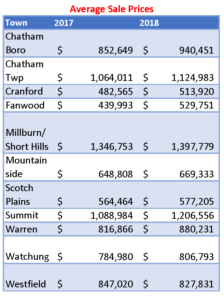 Uncertainty about ramifications from the tax reform, impactful interest rate hikes, and simple resistance to current price levels, have combined to starkly reduce demand at the top price brackets in most towns. Less demand brought price reductions back to the market as sellers discover they cannot all surpass last year’s results this year. So while prices have risen, there are more homes left on the shelves as the season wanes. In nearly all towns, there is significantly more slack in the inventory priced above the median. 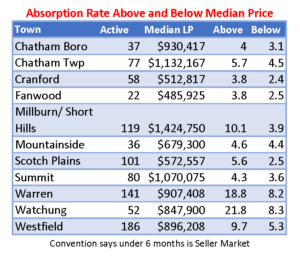 In some towns it will take twice as long to absorb the higher priced homes than the lower. 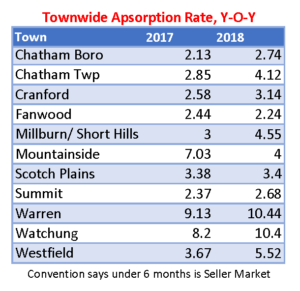 The second chart shows Y-O-Y inventory increases in almost all towns. The chart measures a 6-month lookback from August 15th each year. Is this the entire impact of the interest rate and tax changes? Let’s look again in 6 months.